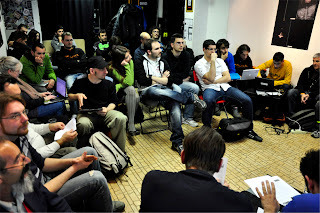 On March 15th about 30 students participated in the Google Summer of Code info session held at Fusolab in Rome, Italy by Ninux.org. Some of the students were well known in the local community and have been participating in the development of open source software, while others were excited to start working on open source. There's always a first time to work on open source software development and we think Google Summer of Code is the best occasion to do it! A few of the students were slightly concerned about the overlap between the program and their exams in July but the mentors explained that with careful and realistic planning delivering a successful project is definitely achievable. Ninux.org is an Italian wireless community whose primary goal is to build a community of skilled people that participate in building open and decentralized wireless networks in the Italian peninsula for experimental purposes. For us the Google Summer of Code has been a great way to attract new promising and talented minds in our community. Many of the students that participated in previous years are still contributing, hacking and experimenting with new technologies with us. We hope to contribute in forming the new generation that will push forward the open source philosophy applied to real life in our country. We believe the open source philosophy is the best approach in solving many of the issues in our society, so we put effort in applying it not only to software, but also to all our other activities. Collaborate, teach, learn and share. The Future is Now!